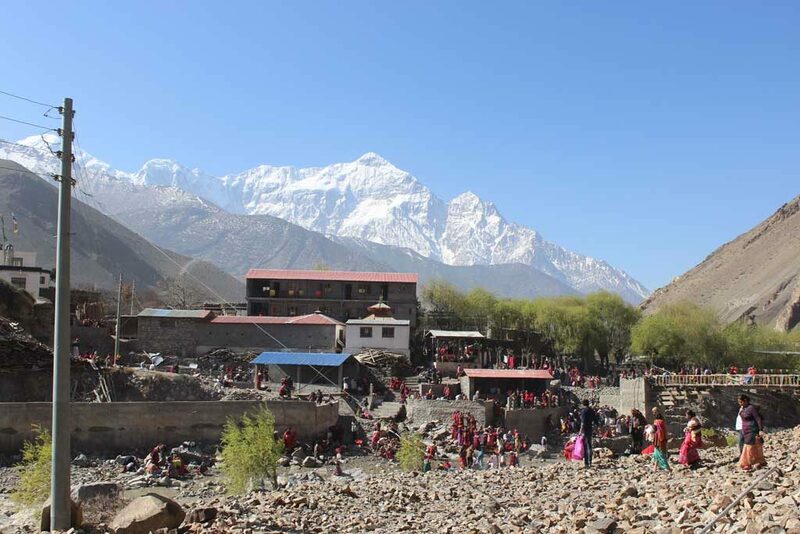 Jomsom Muktinath trek is a classic route that goes along the world’s deepest gorge of the Kali Gandaki River in the Annapurna region of Nepal. 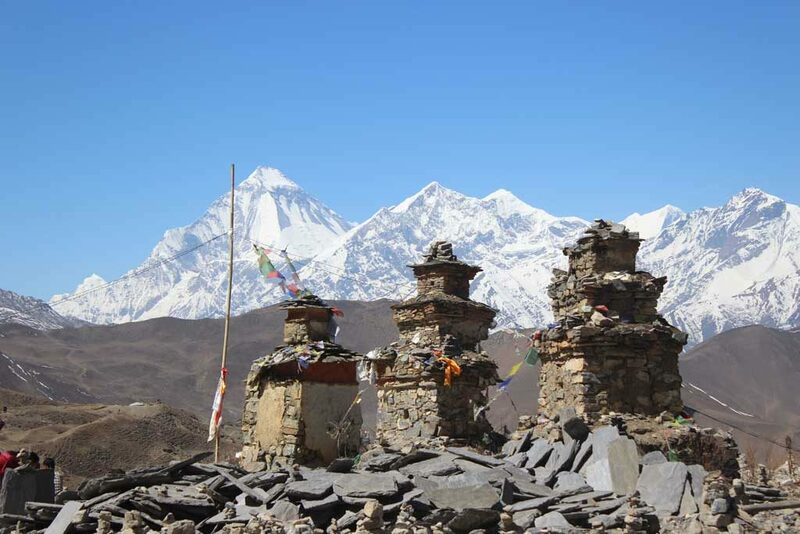 Anyone with a moderate level of fitness can do this trek and the maximum elevation is 3,760 meters in Muktinath. We fly early morning from Pokhara to Jomsom and start our trek on the Tibetan Plateau and arrive at Kagbeni. Kagbeni serves as the gateway to the ‘Forbidden Kingdom of Mustang’ also known as ‘Upper Mustang’. The next day we trek to Muktinath, a popular and sacred place for Hindu and Buddhist pilgrims. The temple has 108 water taps emerging from sacred water springs. 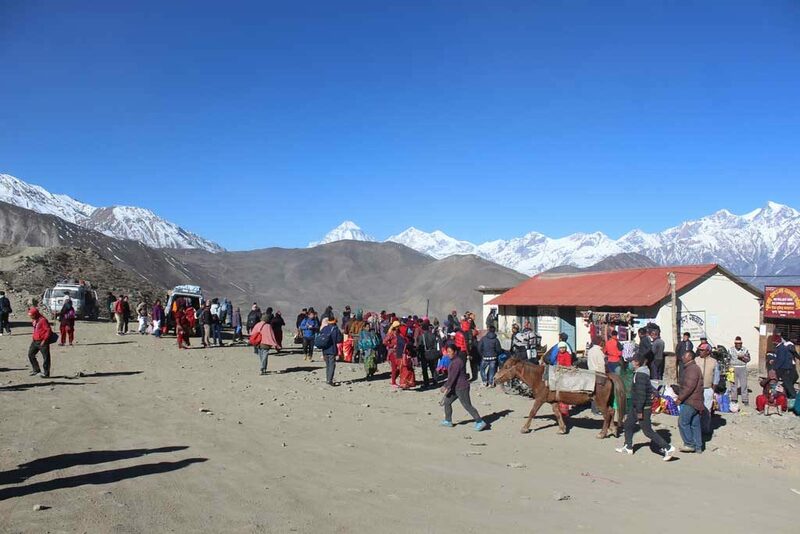 Alternatively, Muktinath Darshan by Jeep is another way to visit Muktinath. 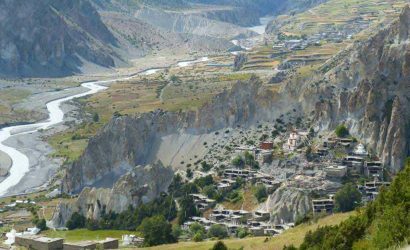 Some major attractions of Jomsom-Muktinath trekking include typical Mustang villages, hundreds of years old monastery, caves, local tribes and scenic landscapes. 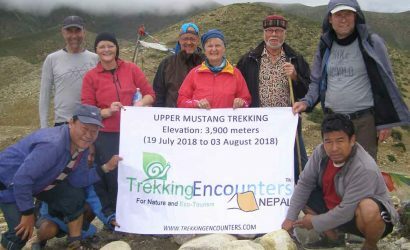 The tree-less barren landscape, a steep rocky trail up and down hill with panoramic views of Nilgiri, Annapurna, Dhaulagiri and several other peaks will add some adventures on this trek. Tatopani is also popular for its natural hot water spring. 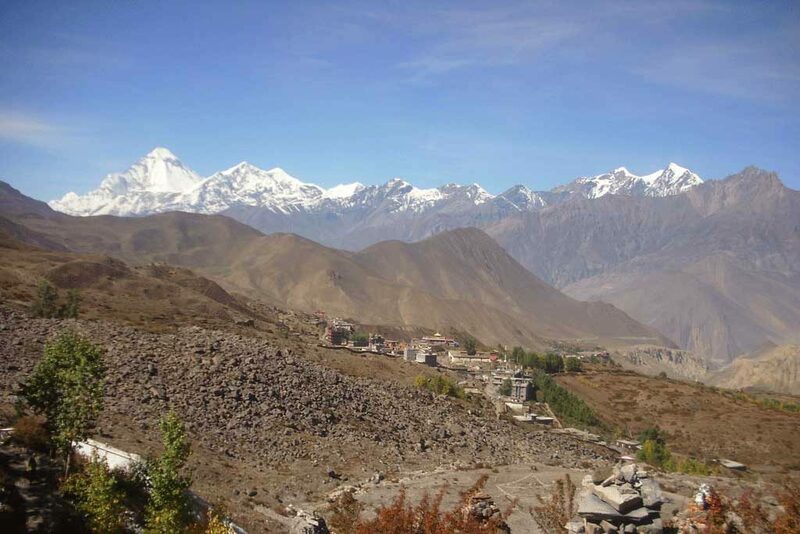 Poonhill is yet another attraction of Jomsom-Muktinath trekking for panoramic views of the snow-capped mountains. Sunrise at Poonhill is one of the important highlights of Jomsom-Muktinath trekking. Interested to explore more in the area? Then Upper Mustang Lo Manthang Trek would be the right option. Fly from Pokhara to Jomsom (2,720m/8,924ft) and trek to Kagbeni (2,800m/9,186ft). We take a scenic flight from Pokhara to Jomsom which will be for less than 30 minutes. Jomsom which straddles the Kali Gandaki River, is the administrative centre for the Mustang district and is a busy place with plenty of lodges on both sides of the river and the facilities like shops, banks, a military post, a police check point, an ACAP (Annapurna Conservation Area Project) information office, a health post, a post office and telephone facilities. 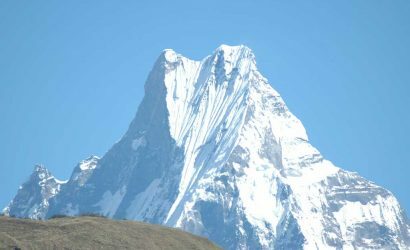 From Jomsom there are two route options for trekking to Kagbeni, the original stony sandy trail on the east bank, or the new route on the west bank which has some tremendous views. Assuming we take the new track, we will come to a long suspension bridge spanning the river; we cross it and after a while will reach the small settlement of Eklebhatti (2,740m/8,990ft). The name Eklebhatti means “one hotel” but this no longer applies because it now has several lodges and shops. At this point, just before crossing the bridge to the east bank, there is a stunning view of Nilgiri North (7,061m/23,166ft). Continuing along the bank from Eklebhatti, we will come to our overnight stop, the village of Kagbeni which stands at the confluence of the Jhong Khola that runs through the village and Thak Khola (Rivers). This is an important place, as it is situated at the junction of three major trails, heading east, west and south respectively. Kagbeni also has a post office, a police check-post, ACAP information centre, several shops, many lodges and a health post. 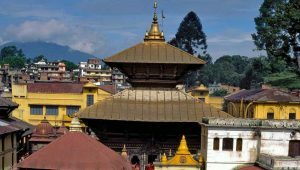 There are also three mani walls (Tibetan Buddhist prayer walls) adorned with prayer wheels, a gompa (Tibetan Buddhist monastery), a kani (archway) and a large chorten (Tibetan Buddhist monument). Trekking time 4-5 hours. Trek Kagbeni to Muktinath (3,760m/12,336ft). Today we leave Kagbeni by the path which rises behind “Hotel Nilgiri View” and continue climbing up the south side of the Jhong Khola valley, above oasis-like fields and orchards. After a persistent climb, we will join the direct trail from Eklebhatti which comes in from the right. Continuing on we will come to the “Romeo and Juliet Lodge” and shortly after passing this we will reach the small few lodge settlement of Khingar (3,280m/10,761ft). The trail actually bypasses Khingar and proceeds to climb to the next charming fortress-like medieval village of Jharkot (3,550m/11,647ft) which is located on a spur of hillside with small willow-fringed ponds below. It has a gompa (monastery), a fine kani and a number of lodges. Once through Jharkot the trail climbs a little more steeply and reaches our overnight stop the village of Ranipauwa (3,700m/12,139ft) which is the first part of the settlement of Muktinath. A few minutes’ walk and an ascent of about 90 meters above the village, takes us to the important religious site of Muktinath proper, the focus for so many Hindu and Buddhist pilgrims. Here there are shrines, gompas and a pagoda-style temple. The village of Ranipauwa has many lodges, teahouses, a few shops and campsites, a police check-post and ACAP information centre. Trekking time 4-5 hours. Trek Muktinath to Marpha (2,670m/8,760ft). Today we head off westward to Kagbeni retracing the previous days route, then trek via Eklebhatti to Jomosom possibly using the older trail on the east side of the Kali Gandaki river, instead of the new route which was probably used on our way north. It is of interest to note that there is a drop of around 1000 meters from Muktinath to Jomosom which will make life easier (!) Continuing south from Jomosom the trail crosses a wooden bridge over the Syang Khola, a tributary of the Kali Gandaki River and reaches the small village of Syang (2,820m/9,252ft) with a gompa perched on the hill above it. Proceeding on from here, in just under an hour, we should arrive at our overnight stop, the very attractive village of Marpha whose narrow paved street is flanked by many Thakali lodges. The Thakalis who originated in the Kali Gandaki valley have emerged as the entrepreneurs of Nepal and are active in many parts of its commercial life. The village has an entrance kani at both ends, a recently enlarged gompa, several shops, a post office, money changing facilities and a library. Trekking time 6-7 hours. Trek Marpha to Ghasa (2,010m/6,594ft). Today’s trek continues south west along the dirt road on the west bank of the Kali Gandaki river, passes Dhonga and reaches the large important two-part village of Tukuche (2,590m/8,497ft), divided by an open flat meadow. Here there are several lodges and hotels, four gompas, a few shops, a library and a brandy distillery (apple, peach and apricot). Next comes the architecturally interesting village of Kobang (2,580m/8,465ft). The houses here are accessed from a partially enclosed central tunnel designed to give protection from the valley’s strong gusting winds. In the centre of the village there is a pagoda-style monastery and below it a 15th century gompa. Kobang also has a post office, a public telephone, few hotels and a health post. A few minutes further on and almost merging with Kobang is Larjung (2,550m/8,366ft) with four or five lodges. The trail crosses a bridge just before entering Larjung the first building of which is a safe drinking-water station. Leaving Larjung the trail crosses two bridges a little further on a long suspension bridge en-route passing through the world’s deepest valley – the Kaligandaki gorge, before entering the small village of Kokhethanti (2,545m/8,350ft), with its four lodges. 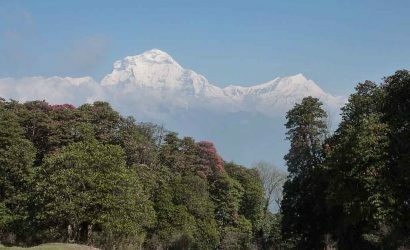 On the trek between Larjung and Kokhethanti there are stunning views of Dhaulagiri and Tukuche Peak. The trail now passes below a line of stone-built houses at the settlement of Dhampu (2,502m/8,205ft) crosses a bridge over the Thak Khola river (as the Kali Gandaki river is now called), continues along the east bank to Kalopani (2,530m/8,391ft) and then comes to the adjoining long straggling village of Lete (2,480m/8,136ft) where there are a number of hotels. The village has a government health post and telephone access. From here the trail descends steeply south-east through a stand of pines and crosses a suspension bridge over the Lete Khola. It now continues to the tiny settlement of Dhaiku/Kaiku (2,085m/6,841ft), drops down steps to cross a wooden bridge over the Kaiku Khola and shortly arrives at our overnight stop the three-part village of Ghasa with accommodation available in each section. 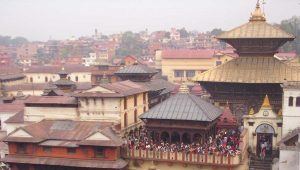 Some of its flat-roofed buildings stand on stilts. The upper part of Ghasa has a large kani, a gompa and three lodges. Trekking time 5-6 hours. A few minutes after leaving Ghasa, the trail crosses a suspension bridge to the left bank and then switchbacks high above the river. 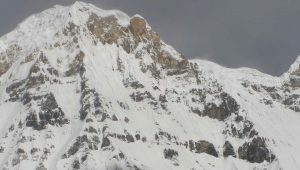 For a considerable distance south of Ghasa, landslides in the River Kali Gandaki gorge occasionally necessitate the route being switched from one bank to the other. Just under an hour from lower Ghasa we will come to the small two-part settlement of Pairothapla (1,890m/6,201ft) and then after a further thirty minutes or so on a steep descent in a landslide area, we reach Kopchepani, below which we change sides again by crossing a long suspension bridge to the west bank. Continuing on, we pass the beautiful Rupse Chhahara (waterfall) and then after crossing a wooden bridge arrive at the village of Rukse/Rupse (1,560m/5,118ft) where there are orange, lemon and banana trees and fields of maize on the steep hillside. Ten minutes beyond Rupse, in the now widening valley, we pass through the long settlement of Titre (1,630m/5,348ft) and reach the large three – section village of Dana (1,400m/4,593ft), which was once an important trade centre. 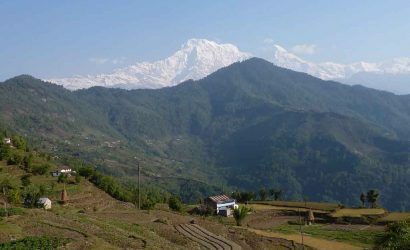 In its final section there are a number of thatched houses and also from this point, excellent views of Annapurna South can be seen. After crossing another suspension bridge – over a tributary - and passing through the small settlement of (1,630m/5,348ft), we arrive at the popular busy village of Tatopani, an ideal place for a rest day. Trekking time 3-4 hours. Today the trek continues to climb and after a while leaving Shikha we pass through the small settlement of Ghopte Kharka from where there are more sightings of Dhaulagiri. Next we reach Phalante (2,270m/7,448ft) with its large school, one shop, a teahouse and two lodges. Further ahead we arrive at Chitre where refreshments are available. The last section of today’s trek from here is still uphill and finally it will take us to Ghodepani/Ghorepani, a bustling village with shops, lodges and camp grounds and because of the attraction of nearby Poonhill/Pun Hill (3,210m/10,532ft), the route at this point is the most heavily trekked in Nepal. Trekking time 3-4 hours. Trek Ghorepani to Tikhedhunga (1,540m/5,052ft) via Poonhill (3,210m/10,532ft). A Poonhill sunrise is one of trekking not-to-be-missed experiences – it is unique. Therefore as the climb to the summit, among rhododendrons, takes about one hour, we will set out on a path from the centre of the village at least one hour before sunrise. There is a lookout tower on the highest point and below it is a very welcome tea station. Having enjoyed this experience we will then head off for Tikhedhunga after breakfast at Ghorepani. The trail passes pleasantly through rhododendron forest and descends at Ulleri village (1,960m/6,430ft) and reaches to Tikhedhunga (1,540m/5,052ft) where we stop for overnight rest. Trekking time 5-6 hours. 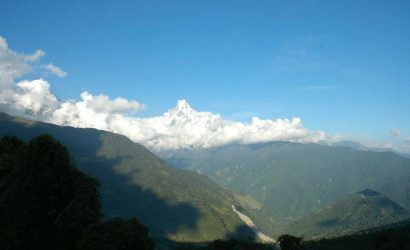 Trek Tikhedhunga to Nayapul via Birethanti (1,040m/3,412ft) and drive back to Pokhara. Descending from Tikhedhunga via Birethanti (1,040m/3,412ft) to Pokhara, one can see mules loaded with goods en-route. There is a small Walk up to Nayapul (New-bridge) from Birethanti and we take a drive for one hour to Pokhara by bus or taxi (42km). We then check in to a hotel in Pokhara and relax for the rest of the day. Trekking time 3-4 hours.